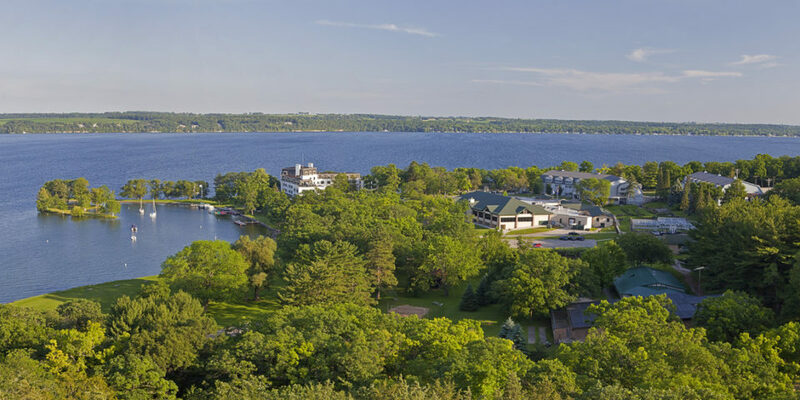 Travel Green certified and open 365 days a year, Green Lake Conference Center is a 900-acre retreat and conference center with lakeside hotels in a rural, natural setting on the serene shores of Wisconsin's deepest lake. Fifty meeting rooms provide 60,000 square feet of event and meeting space and feature robust high-speed WiFi. Another 30,000 square feet of reservable outdoor space includes a 400-seat amphitheater and several fire rings. Over 300 hotel rooms and suites are complemented by lake houses, forest cottages, cabins, dormitories, and campgrounds. Explore 12 miles of trails that meander through and along a 54-acre prairie, climax hardwood forest, and spring fed streams. Activities include paintball, disk golf, challenge courses, ballroom dance instruction, yoga, geocaching, boat and bike rental, and championship golf. Green Lake Conference Center was founded in 1944 and its experienced staff continue a long tradition of serving with excellence. $75 Hotel Rooms & $90 suites November through March. Good through 2018. Valid for single or double occupancy.